CASTER STEERING MAKES CUTTING BEAUTIFULLY CURVED BEDS EASY. OF THE CUT, AND CREATES BEAUTIFUL MOUNDED BEDS. 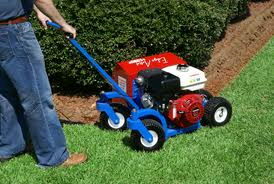 ** Please call us for any questions on our bed edger rentals in Fairview Heights IL.